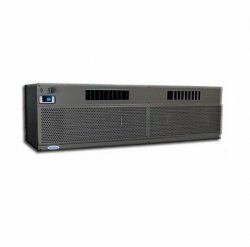 The CP 8000S wine cellar cooling unit has a cooling capacity of up to 2000 cubic feet. Please specify if you want the Solenoid Valve or Electronic Control for the Cellar Pro Split systems. Solenoid Valve - typically used indoors. There is a separate controller for the evaporator and the condensor. Electronic Control - Mandatory if the condensor will be placed in a cold environment or the condensor will be managed by the evaporator. Inside the cellar, the evaporator unit is designed to mount on the wall near the top of the wine cellar. Outside the cellar, the condensing unit is attached to the evaporator unit by a line-set (sold separately) up to 100 equivalent feet. ALL Cellar Pro Split systems are available with optional exterior hood which allows the condensing units to be installed in external environments, subject to the temperature range noted above. Please inquire. Exposure to temperatures below 40°F requires the addition of our low ambient heater kit. The split systems are not shipped with the fan cycling switch required for low temperatures. On its own, the cooling unit will function in environments above 40F/4C. If your condenser will be in and environment below 40F/4C and approaching as low as -20F/ -28C you require the Low Ambient Heater kit. The kit includes both the compressor heater and the fan cycling switch. NOTE: Cellar Pro's Split evaporators use the same variable speed fans and advanced controls that we use in our VS Series through-the-wall cooling units. As a result, their Split systems provide super-quiet operation, outstanding cooling power and adjustable humidity control that our competitors can't match. CellarPro wine cellar cooling units are greatly reliable cellar coolers made in the United States of America. CellarPro LLC is situated in Cotati, CA, California, 94931 USA. Available for shipping thoughout the US and Canada. Cellar Pro options are shipped at no charge as long as they are ordered with main Cellar Pro unit. NOTE: Be sure to have the installing technician complete the CellarPro checklist upon installation. You will then send this to Cellar Pro to activate your warranty.